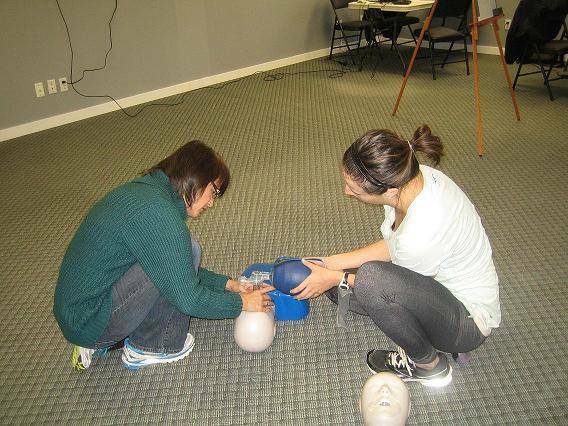 CPR-C is the most popular CPR course Vancouver First Aid offers. We offer this CPR course at the most competitive price in comfortable and convenient locations around the Lower Mainland, including Vancouver and Surrey. Scroll to the bottom of the page to see upcoming CPR level “C” classes and to register. What will I learn in CPR level “C”? The cost of CPR-C is $64.99. Course fee includes a take home manual, certification fee and all applicable taxes. Learn effective CPR rescue techniques for adult, child and infant victims by taking CPR level “C” and AED training. How long is this CPR course? The length of the course is approximately 4-5 hours. Successful candidates will receive a workplace / academic approved CPR- C & AED certificate issued by the instructor upon completion. Certifications provided are nationally accredited and are valid for up to three years. Annual re-certification may be necessary for some educational programs and employers. No prior first aid knowledge is required to take this course. How do I register for CPR-C? To register for this CPR course, please select a convenient time and location from the list at the bottom of this page. Fill out the registration form and complete payment to guarantee your spot in the course. If you have any questions or concerns please feel free to contact us via e-mail info@vancouverfirstaid.ca or by phone at 778.709.9180. Re-certifications are available for this course. To register for a re-certification select CPR-C from the re-certification menu bar or from the Upcoming Courses side bar. Do we offer private CPR classes? Private CPR-C classes are available upon request. We offer private courses in Burnaby, Coquitlam, Delta, Richmond, Surrey, Vancouver and throughout the Lower Mainland. Please feel free to contact us via e-mail info@vancouverfirstaid.ca or by phone at 778.709.9180 to schedule a private class. Please see locations page for directions and maps. Transfers and refunds can be accommodated 72 hours prior to the course.